Americas Best Value Inn Jourdanton/Pleasanton offers the most value for your money when staying for business- pleasure- or just passing through. We offer clean spacious rooms- a 24-hour front desk- free coffee in lobby- free full breakfast- and free Wi-Fi throughout the property. Our guest rooms include microwave- mini-fridge- coffeemaker- hairdryer- 40 inch flat panel HD satellite TV- HBO- ESPN- alarm clock radio- and desk with lamp. Take advantage of our extremely comfortable beds and relax while saving money year-round with our Kids Stay Free Policy 11 and under in parents room. For your convenience our hotel is a 100 percent smoke-free property. Pets are welcome- restrictions and charges apply. We are located off Highway 97- and are near attractions such as Coastal Bend College- Longhorn Museum- and The Alamo. Americas Best Value Inn Jourdanton/Pleasanton is your best choice within the Southern region of Texas- just 40 miles away from San Antonio. 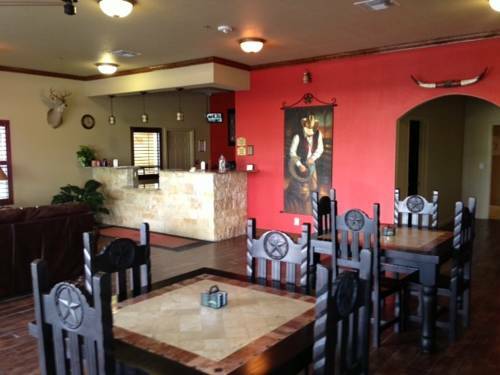 We offer ideal accommodations and location whether you are in town for business- sightseeing- or simply passing through on your way to Laredo or Dallas. At Americas Best Value Inn Jourdanton/Pleasanton our goal is to provide our guests a great experience- not just a place to stay. At Americas Best Value Inn Jourdanton/Pleasanton- We ve Got You Covered from the time you hit the road until your head hits the pillow.